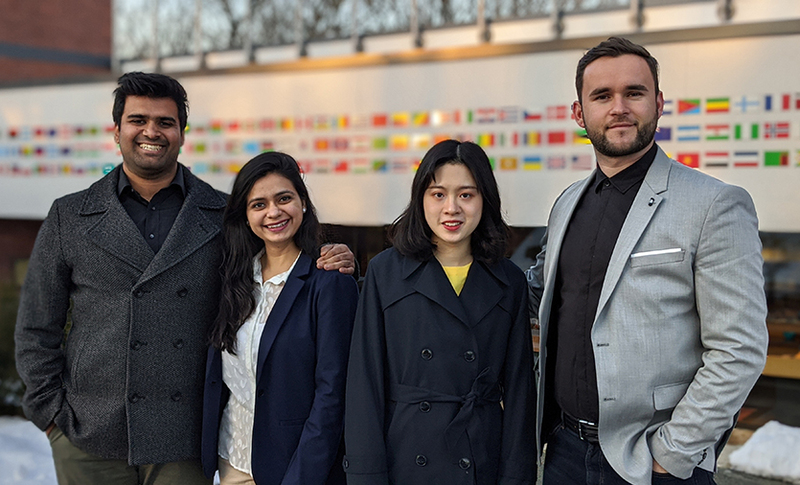 The Brandeis International Business School Student Association (IBSSA) organizes student programs, activities, cultural celebrations, leadership opportunities and civic engagement at Brandeis IBS. Provide a platform for the discussion of student concerns and act as the instrument by which student interests may be voiced to the administration and faculty of the academic programs at Brandeis IBS. Enrich the graduate experience by providing organized student-centered programs, activities and services, which celebrate diversity, promote awareness, and foster leadership, civic engagement and student development. Support other student-run organizations and clubs within Brandeis IBS. From left to right: Yang Zhang, Xiaoxi Ma, Tianyi Zhou, and Sanjana Dugar. IBSSA meets weekly throughout the academic year. Meetings are open to all Brandeis IBS students, faculty, and staff. For more information, please attend an upcoming meeting or join the Brandeis IBSSA Facebook group.